This event is free of charge and open to the public. A sign-in sheet for 15 minute, one-on-one meetings with Rep. Srinivasan will be available upon arrival. 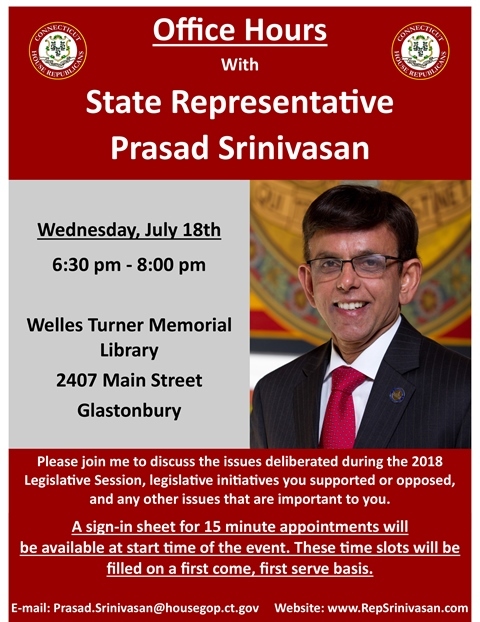 If you have any questions, or are unable to attend but would still like to connect with Rep. Srinivasan, please contact him at 1-800-842-1423 or Prasad.Srinivasan@housegop.ct.gov. In the event that office hours must be postponed or cancelled, a notice will be posted on Rep. Srinivasan’s website at www.RepSrinivasan.com.